Starting Off Strong in 2018! 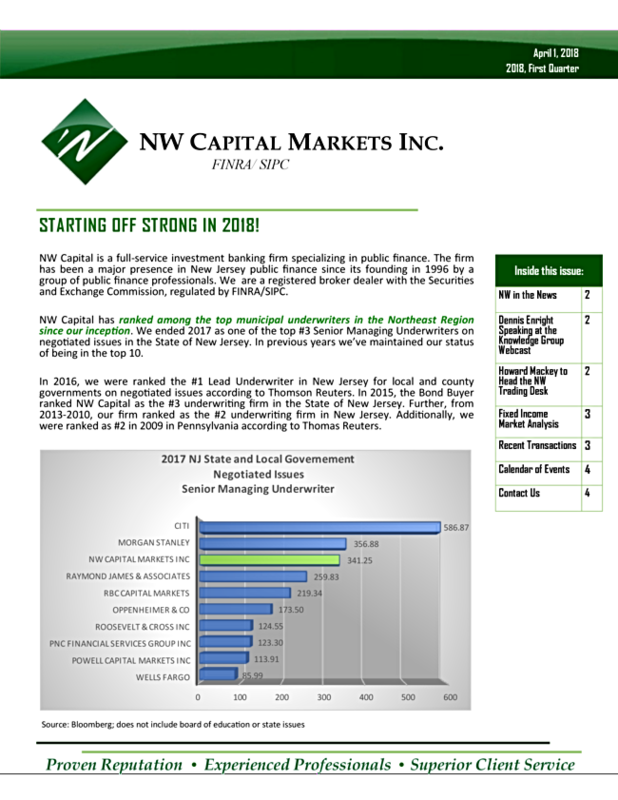 Disclaimer: This report is prepared by NW Capital Markets Inc. a member of FINRA/SIPC is to be used for informational purposes only. This report is the intellectual property of NW Capital and may not be reproduced, distributed or published by any person for any purpose without NW's express prior written consent. In no event should it be construed as a solicitation or offer to purchase or sell a security. The information and any opinions contained in this email communication have been obtained from sources believed to be reliable, but is not guaranteed by NW Capital as to accuracy or completeness. Unless otherwise noted, market data is from Bloomberg, the Bond Buyer, Moody's, S&P Global and Thomson Reuters Municipal Market Data.